Patricia Clark’s poems explore themes of love, mortality, and loss in the setting of the natural world. 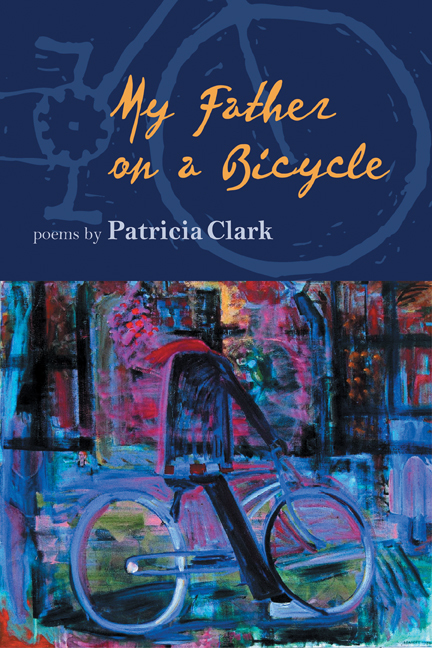 In the outdoors, near rivers and on walks, the speaker in these lyrical poems meditates on subjects she observes, as in the book’s title poem "My Father on a Bicycle," where Clark writes of her father, "I can see him, heron-alert, bareheaded." Elsewhere, Clark’s poems are celebratory, urging the reader "To hunker down and yet be lifted up." Finally, the poems explore memory and the emotional nuances of interior life, reaching a series of transcendent moments, illustrated by the poem "Riverwalker," where the speaker comes to see water, riverwater, and life itself, perhaps, as a "quick-moving force." The domestic and natural worlds in Clark’s poems allow the reader to attain something quietly sublime. Patricia Clark is Poet-in-Residence and Professor in the Department of Writing at Grand Valley State University.